Texas Design Now features fashion, accessory, furniture, and industrial designs by artists and artisans living and working statewide. The participants hail from Austin, Dallas, Houston, Marfa, San Antonio, and Wimberley, and their creations demonstrate the diversity, vitality, and originality of Texas’s creative communities. These 35 participants were chosen by Guest Organizers Chris Goins and Garrett Hunter, who drew on their extensive experience in fashion and interior design. Texas Design Now features work by: Mary Lou Artz, Esé Azenabor, Amy Blakemore, Rob Bradford, James Brummett, Xavier Castillo, The Community Cloth, Andy Coolquitt, Johnny Dang Diamond Grillz, Chloe Dao, Kate de Para, Kate de Para with Shane Tolbert, Sameera Faridi, Finell, Alyson Fox, Garza Marfa, Peter Glassford, Manoosh with MarilynBiles, Judy Masliyah, Dennis Nance with James Hays, Yasmina Johnston, Angel Oloshove, Oudvark, David Peck, Ryan Reitmeyer, Alyce Santoro, s.t.e.f., Warbach, Claire Webb, Michael Wilson, Michael Yates, Michelle Yue, and Peter Zubiate. The participants’ works cover a broad range of styles, from exquisitely bejeweled clothing, hats, necklaces, and custom grillz (Artz, Azénabor, Bradford, Castillo, Johnny Dang Diamond Grillz, Faridi), to inspiring handcrafted garments and furniture (Brummett, Glassford, Nance, Hays, Wilson, Zubiate). The mixture of forms on view is similarly broad, ranging from utilitarian and sculptural vessels (Blakemore, Finell, Oloshove), to inventive lighting (Warbach, Oudvark), luxurious personal adornments and accessories (Finell, Johnston, Webb, Yue) and inspired home furnishings (Garza Marfa, Fox, Reitmeyer, Yates) that are available to a wide range of consumers. “When we put on our clothes in the morning, or put pieces of furniture into our homes, we invite the outside world in. People understand us based on how we make these choices,” says CAMH Director Bill Arning, arguing that fashion and interior design are an accessible form of conceptual art. As visitors to Texas Design Now will see, some designers have put contemporary twists on classic silhouettes through the inventive use of prints and tailoring (Dao, Masliyah, s.t.e.f., Peck). Other designers use beading, sequins, and embellishment to create bejeweled gowns and accessories. On view is a Fiesta dress from San Antonio. Products of a nearly century-old tradition, Fiesta dresses are highly embellished garments worn during special “coronation” events by young society women in San Antonio. The generous trains of these dresses—covered in rhinestones, sequins, and beading—are sewn by hand and often weigh more than 50 pounds. At CAMH is a dress sewn by Mary Lou Artzaccompanied by a similarly extravagant jeweled crown made by Xavier Castillo. Offering another point of view is Dallas-based fashion designer Yasmina Johnston who utilizes unique, unexpected materials to produce garments with a sculptural sensibility. Her jet black folded-paper dress on view in Texas Design Now is an architecture-for-the-body that cuts an elegant and dynamic silhouette. Her I’m Caged In skirt is similarly edgy: its shiny grid simultaneously conceals and reveals its wearer’s body, acting as a blueprint for a garment, and a daring work of wearable art. Johnny Dang Diamond Grillz have definitely changed the face of fashion. Produced by Johnny Dang with C. Stone and Paul Wall, these custom-produced jewelry designs that are worn atop the teeth have been rocked by Beyoncé, Paris Hilton, Katy Perry, Lil Wayne, and Kanye West, among many others. Combining gold, diamonds, emeralds, rubies, and other precious stones, these flashy accessories were introduced to mainstream America in rapper Nelly’s 2005 music video Grillz, which featured more than 70 close-up grill shots. Dallas-based Rob Bradford, also known as “Rhinestone Rob”, encrusts both garments and accessories with over-the-top embellishment to produce memorable, one-of-a-kind objects. Included in this exhibition are a helmet for a dazzling Trojan warrior and a gown featuring a chest-plate of taxidermy duck wings. Like Dang, Bradford designs for wearers who definitely want to stand out in a crowd. A number of works on view are the result of collaborations whose motivations are artistic, socially minded, and the result of long-term friendships (de Para/Tolbert, Manoosh/Biles, The Community Cloth, Fox/Yates). The Community Cloth is a micro-enterprise initiative empowering refugee women in Houston that supports the production and sales of handmade, indigenous arts and crafts by artisans from Afghanistan, Burma, Myanmar, Sudan, and other countries. The production of The Community Cloth’s bags, scarves, and household items empower the women who produce them and sustain cultural heritage and craft traditions that are often in danger of being lost. Anna Wilson designs Manoosh’s scarves in collaboration with painter Marilyn Biles, bringing together the vision of two Houston-based artists in the process. Manoosh’s luxurious cashmere and silk scarves are adorned with digitally printed details taken from Biles’s color-strong abstract paintings. The fact that Biles is Wilson’s future grandmother-in-law gives their work together an endearing narrative edge. In addition to wearable fashions, Texas Design Now features cutting edge furniture and industrial designs that adorn contemporary living spaces. Garza Marfa’s interior furnishings combine the clean, crisp lines and simplicity ofmidcentury designs with colors, textures, and materials influenced by Jamey Garza and Constance Holt-Garza’s western environments. Their inviting objects mix leather, wood, and canvas with powder-coated steel in bright industrial colors like orange, citrus yellow, and turquoise. Seen on a ranch or in a Modernist interior, Garza Marfa’sdesigns would look equally at home. Benches, desks, and chairs by Michael Wilson (Wimberley, TX) achieve a striking balance between crafted control and organic growth. As a sculptor, he intuitively understands when he’s carved away enough material to reveal the essence of the wood he’s shaping. His unique vision and sensibility is evident in sensual curves, unexpected bumps, and undulating surfaces that invite caresses and reclining. Warbach is a design build studio based in Austin whose bespoke lighting graces private homes and public venues across Texas and beyond. From initial concepts to precision execution, Warbach’s team produces scintillating, exciting results. Viewers to Texas Design Now will be greeted by an undulating lighting solution for CAMH’s entrance that offers sculptural illumination. Warbach’s design will continue to grace the museum’s entryway following the close of the exhibition. Austin-based Finell design and manufacture neo luxe housewares and fashion accessories. The unique sculptural form of their handbags, clutches, and totes are inspired by origami shapes, and these supple leather accessories can all be folded flat. Full of progressive aesthetics and innovative features, their items are as refined and unique as the customers who appreciate them. Texas Design Now builds on a legacy of early CAMH exhibitions such as This Is Contemporary Art (1948) and The Common Denominator: Modern Design 3500 B.C.-1958 A.D. (1958), which presented design and artworks side-by-side, and suggested that “the contemporary” was not simply an artistic proposition, but a matter of personal and aesthetic choice. With communities of adventurous supporters who find inspiration in the vision provided by these local talents, we imagine that Texas will continue to produce innovators and leaders in the field of design. Texas Design Now is Guest Organized by Chris Goins and Garrett Hunter, with support from CAMH Curator Dean Daderko and Curatorial Associate and Business Manager Patricia Restrepo. Chris Goins has worked in the fashion and design industry for more than a decade, gaining experience in the luxury retail, home, beauty, and fashion markets. While completing a BS from the University of Houston in Consumer Science and Merchandising, she began her career working as a buyer at Kuhl-Linscomb. Recently appointed the General Manager of Retail for the Museum of Fine Arts, Houston [as of July 2015], Goins previously served as the Store Director of the iconic luxury fashion retailer Tootsies in Houston. Inspired by intricate details, impeccable construction, and boundary-pushing designers who explore unexpected materials and movement, Goins has made a name for herself as one of Houston’s most-trusted sartorial experts. Garrett Hunter is the Principal and Owner of an eponymous boutique design firm located in Houston. His career began under internationally renowned designer and dealer Pam Kuhl-Linscomb. Today, his firm has designed and completed numerous residential and commercial projects in Houston, Austin, New Orleans, Los Angeles, New York City, and rural projects throughout Texas. Inspired by contemporary art and esoterica, his projects explore the friction between minimalism and avant-garde grandeur. In 2011, Hunter curated an exhibition at Peel Gallery called California Cool, which displayed important furniture, textiles, graphic design, and jewelry with a focus on the Los Angeles area. In 2012, Hunter curated the Lawndale Design Fair at the Lawndale Art Center, which highlighted active contemporary designers at all career stages. Texas Design Now is supported in part by Brochstein’s Inc., Sara and Bill Morgan, Scott and Judy Nyquist, and Mickey Rosmarin and Tootsies. This exhibition has been made possible by the patrons, benefactors and donors to the Museum’s Friends of Steel Exhibitions: Director’s Circle—Chinhui Juhn and Eddie Allen, Fayez Sarofim, Michael Zilkha. Curator’s Circle—Dillon Kyle Architecture, Inc., Marita and J.B. Fairbanks, Mr. and Mrs. I. H. Kempner III, Ms. Louisa Stude Sarofim. Major Exhibition Circle—A Fare Extraordinaire, Bank of Texas, Bergner and Johnson Design, Jereann Chaney, Elizabeth Howard Crowell, Sara Paschall Dodd, Jo and Jim Furr, Barbara and Michael Gamson, Brenda and William Goldberg, Blakely and Trey Griggs, George and Mary Josephine Hamman Foundation, Jackson and Company, Louise D. Jamail, Anne and David Kirkland, KPMG, LLP, Beverly and Howard Robinson, Lauren Rottet, Robin and Andrew Schirrmeister, Leigh and Reggie Smith, Yellow Cab Houston, Mr. Wallace Wilson. The Museum’s education and outreach programming has been made possible by the patrons, benefactors and donors to its Families of Steel Programming: Vera and Andy Baker, Mary and Marcel Barone, Louise D. Jamail, Kinder Morgan Foundation, Robert and Pearl Wallis Knox Foundation, Leticia Loya, Marian and Speros Martel Foundation Endowment, M.D. Anderson Foundation, Elisabeth McCabe, Andrew R. McFarland, Nordstrom, Nancy O’Connor, Cabrina and Steven Owsley, Ms. Louisa Stude Sarofim, Texas Commission on the Arts, Kim and Gerard Trevino and Bridget and Patrick Wade. Teen Council is supported by Ms. Louisa Stude Sarofim. The Museum’s operations and programs are made possible through the generosity of the Museum’s trustees, patrons, members and donors. 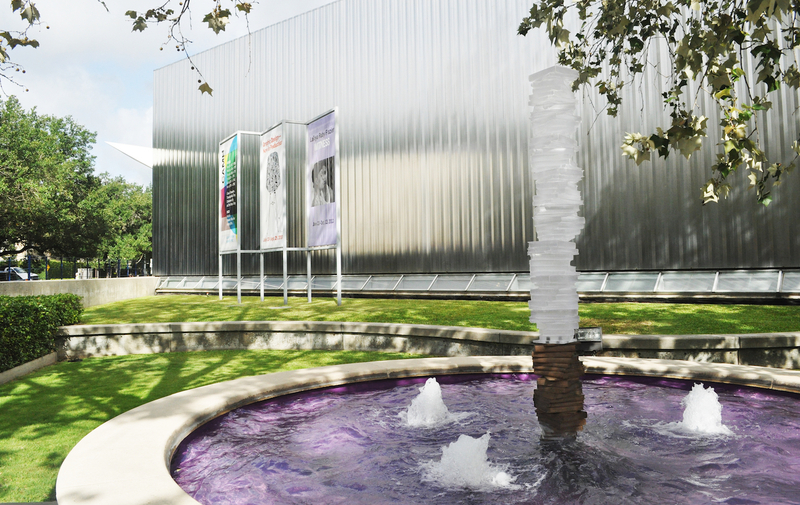 The Contemporary Arts Museum Houston receives partial operating support from The Brown Foundation, Inc., Houston Endowment, the City of Houston through the Houston Museum District Association, the National Endowment for the Arts, the Texas Commission on the Arts, The Wortham Foundation, Inc. and artMRKT Productions. CAMH also thanks its artist benefactors for their support including Michael Bise, Bruce High Quality Foundation, Julia Dault, Keltie Ferris, Mark Flood, Barnaby Furnas, Theaster Gates, Jeffrey Gibson, Trenton Doyle Hancock, Jim Hodges, Joan Jonas, Jennie C. Jones, Maya Lin, Julian Lorber, Robert Mangold, Melissa Miller, Marilyn Minter, Angel Otero, McKay Otto, Enoc Perez, Rob Pruitt, Matthew Ritchie, Dario Robleto, Ed Ruscha, Cindy Sherman, Shinique Smith, John Sparagana, Al Souza, James Surls, Sam Taylor-Johnson, William Wegman, and Brenna Youngblood. Texas Design Now is organized by guest organizers Chris Goins and Garrett Hunter. Texas Design Now will be accompanied by a full-color, fully illustrated catalogue with a foreward by CAMH Director Bill Arning, a transcribed conversation between Arning, Guest Organizers Chris Goins and Garrett Hunter, CAMH Curator Dean Daderko, and Curatorial Associate Patricia Restrepo. Designed by Amanda Thomas, the catalogue also features biographies for the 35 artists and artisans participating in this exhibition.